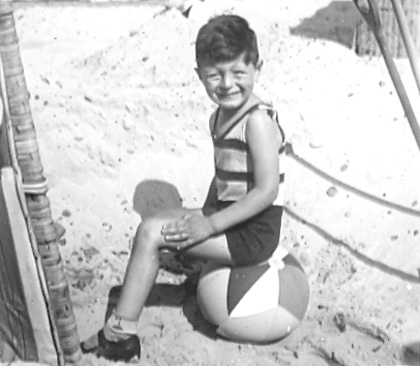 Rudi was born in Berlin in 1926 and spent his childhood years there with his parents and younger sister. Rudi’s father was a dentist and the family lived in a flat with one room set aside as his father’s surgery. The family were Orthodox and kept a kosher home but were fully integrated into German culture and society. Rudi’s parents had many non-Jewish friends. Rudi went to a German school from the age of six and only experienced one anti-Semitic incident during his four years at primary school. His main memory of the Nazis before 1936 is of seeing and hearing the marches of SS and SA men along the main road where he lived. Rudi found these marches, and the aggressive songs the marchers sang, terrifying. Rudi pinpoints an incident in 1936 as the turning point for his family. As hewas setting off for school, two plain-clothes Gestapo arrived and pushed their way into the flat while his parents were still in bed. After Rudi had left, the Gestapo told his parents to go the headquarters of the Lodge. Rudi’s father was President and his mother was Treasurer of the ladies’ Lodge. They were assembled, with other members of the Lodge, and made to stand silently in a line for hours. Towards the end of the afternoon, Rudi’s mother was forced to hand over the money she had brought with her which belonged to the Lodge. Finally, the people were released and told to make their own way home. After that, Rudi’s parents decided they had to leave Germany. His father came to England five times, and his mother three times, to get entry visas for the family. His father also had to get permission from the dental board to work as a dentist. The family moved to Bradford on 10 November 1937. On arrival, they had to start life again from scratch. Rudi’s father had to start earning a living immediately, which wasn’t easy. Rudi’s father enrolled him in Bradford grammar school where he made rapid progress in learning English, though he found it hard to make friends. However, the family were very glad to get out of Germany and Bradford became home straight away. Rudi did National Service in the Army and followed his father into dental practice. He met his future wife Marianne through a youth group attached to a London synagogue. Rudi and Marianne settled in Bradford and in 1959 decided to change their name from Rudi’s original surname, Liebrowitz, to the Anglicised version Leavor. For many years Rudi has been an active member of the Reform synagogue in Bradford. He and Marianne have four children and eight grandchildren. Rudi's story: why remember the Holocaust?